I must confess that Daffodils make the hairs on the back of my neck stand up for very different reasons. In Britain they are evocative of Spring, when they come into full flower it usually coincides with those wonderful first sunny but cold days of early spring such as we have had for the past few days in Surrey. Unfortunately there are no native daffodils (Narcissus pseudo-narcissus) that I know of in this area and so locally the experience has to be gained from those rather more gaudy cultivars and therein lies the rub. I like some Daffodils (or more generally Narcissus species) in their right place, to me that means either in their natural habitat in which case we are talking about species which are predominantly southern European, or in gardens where cultivars are more commonly grown than species. Unfortunately, we seem to suffer (in my opinion) from a surfeit of Daffodils elsewhere in places they do not belong!! Firstly, the mass planting on roadside verges, roundabouts or any other convenient grassy area mostly sponsored by local authorities. Rather than use delicate Narcissus species including the native species, the vast majority of plantings involve obnoxious cultivars that have as much subtlety as a brick wall. Why??? Secondly and more importantly, Daffodils present visible evidence of the laziness and anti-social behaviour of "fly tippers" who regard plants as disposable and throw them out with gay abandon, usually apparently from cars. The roads across the downland in Banstead have many clumps of various Narcissi that on the whole only occur within about 5 metres of the carriageway, i.e. throwing distance. AND, it is not just Daffodils, other rubbish includes forms of Crocus, flowering Hyacinth and other sundry bulbous species. 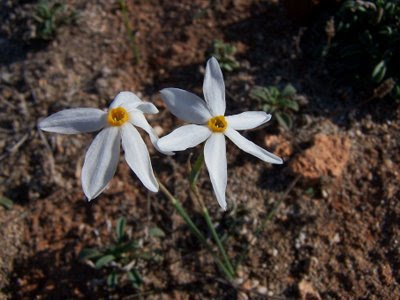 Sublime - Narcissus serotinus growing in southern Spain. Chosen perversely to represent the genus because it is an autumn-flowering species!! Now some people respond to my rants by suggesting that they brighten up the countryside as if the countryside is there purely for their entertainment and amusement. I grant you that apart from offending my eye around here they do little damage to habitat, at least so far. To me however it is what they represent in the form of the total lack of respect that people have for the countryside that is so galling. Finally however the other night the television news carried a snippet about some poor guy in Gloucestershire who spends his time digging up alien Daffodils because of fears that they may pollinate populations of the native species, I can't help feeling he is fighting a losing battle. From conversations with many over the years, I realise that I am in a minority of one so I hope I haven't offended anyone with these views!!! http://www.iwcp.co.uk/news/rare-species-ploughed-as-council-make-bloomer-20496.aspx, in which natural rarities were destroyed in favour of a load of bloomin' rubbish! Nice toothwort photos and info. lower down the blog. I wonder if I might find that species down here? Thanks for the comments. Your example is a classic!! Rather like one of our local authorities that has a list of roadside verges that home unusual species that should only be cut later in the year, but it is never circulated to the workers! I am sorry to say I have never been to the IOW and so don't know if Toothwort occurs there but if you have Hazel woods on chalk the chances are good I would have thought.